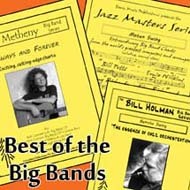 Festival 3-Chart Program - "Best of the Big Bands"
With so much incredible music in the Sierra Music catalog, it is impossible to narrow it down to the 3 "best" charts. However, here are 3 amazing charts that were recorded by 3 great big bands and have gone down in history as some of the best big band music ever recorded. These charts will make for an exceptional festival program!